We are engaged in offering premium quality products to our clients. We are one of the leading Manufacturer, Supplier & Exporter of Sliding Wardrobe such as Black Magic Wardrobe, Sliding Wardrobe with Gloss Magic. These are widely appreciated for their superior quality, elegant designs and neat finishing. Our product range are as per industry standard. 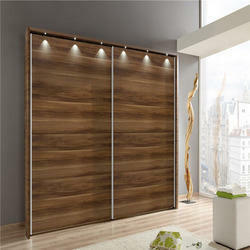 We are one of the prominent manufacturers, traders, wholesalers and exporters of high quality 3 Sliding Door Wardrobe. These wardrobes are manufactured from a unique combination of optimum grade wood, MDF, plywood, and mirror that is obtained from trusted vendors. Available with us at highly affordable market prices, these wardrobes are known for attractive design and stylish appeal. We offer optimum quality Wardrobe to our prestigious customers. Made from high quality wood, these wardrobes are widely used for storing cloths and other household items in most efficient manner. With our well connected and spacious distribution network, we deliver these wardrobes within the promised time constraint. In addition to this, these wardrobes can be customized as per the requirements of the customers. Owing to the rich experience and knowledge of this field, we have been able to offer optimum quality Double-Door Sliding Wardrobe to the customers. Available with us at highly reasonable market prices, these wardrobes are highly demanded in the market for their excellent finish and spacious interior. 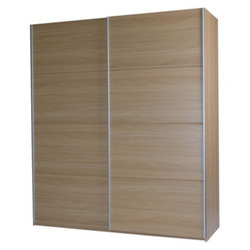 The wardrobes, offered by us, are available in customer stated specifications. We offer Sliding Wardrobe with Gloss Magic to our valuable customers. Made as per the industry laid standards, these wardrobes are known for its appealing look and spacious interiors. 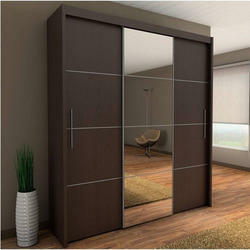 Available with us at highly affordable market prices, these wardrobes are available in customers stated specifications. To ensure a defect free range, these wardrobes undergo different predefined quality assurance tests by our team of quality controllers. Looking for Sliding Wardrobe ?